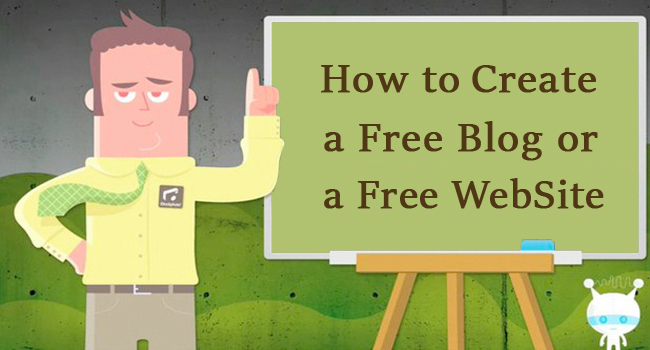 Knowing how to create a free website or a free blog could be useful to some people. We shall show you how to set up a website or blog without it costing you a single cent. We should first stress, however, that such sites are generally unsuitable for professional bloggers or those who use internet marketing as their primary source of income. As shall become apparent, there is a price to pay for free websites and blogs, though more in terms of inconvenience and a lack of customization than financial outlay. Each of these will be split in subsections according to the facilities offered. For example, some free web hosting services do not allow you to use you own domain name, and only very few free domain names can be transferred across web hosts to different Name servers. Some content management systems (CMS) such as WordPress can be self-hosted on your own website or hosted on the CMS site. 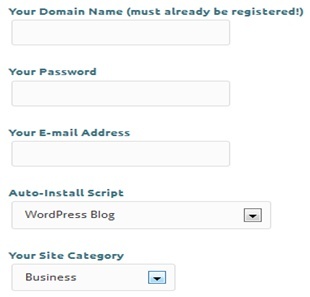 For example, you can use a free hosted version of WordPress on WordPress.com or you can go to WorPress.org and download the software to your own site. The hosted WordPress blog is ideal for hobby bloggers and those maintaining a family blog or any other amateur purpose. For professionals, however, this can be a restrictive platform. 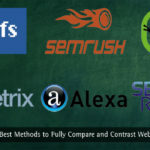 Although you have a large choice of themes or templates, the selection is still small compared to the thousands available for the self-hosted version. You will also be unable to download plugins, whereas these are at the heart of many professional blogs. You are unable to access the coding, so you are extremely limited in how you can customize the look and feel of your blog. On top of all that, you will have third-party adverts on your site and an unprofessional-looking domain name (mysite.wordpress.com). Sure, you can pay $30 to remove the adverts, and the same to give some limited access to the coding, but a free hosted blog is still very restrictive for professional blogs. Pro bloggers need total control over their advertising and branding, and you don’t get that with a free blog. Many people get confused between Blogger and BlogSpot. Blogger is the publishing platform that can be used to host your own blog with your own custom domain (for free). BlogSpot is the free domain service provider that uses Blogger as a platform, similar to WordPress.com. The URL of your blog will be yourfile.blospot.com but unlike WordPress.com you can edit the source code, integrate Google Adsense. It is possible to use branded custom URL with BlogSpot blogs (no extra charges will apply). Serious issue with BlogSpot blogs is that Google owns your blog, not you, and can terminate it without notice at any time. In spite of all this, BlogSpot is a popular free blogging platform, and many people are perfectly satisfied with it. Add to the fact that you cannot use a specific page as a static or landing page (must be the latest post, there is a trick to solve this problem but they are not providing any option to do this.) and you can have no more than 10 static pages, then Blogger seems fine only for small personal blogs. Used by Lady Gaga and Barrack Obama, Tumblr is increasing in leaps and bounds. It now has over 165 million blogs, and appears to be capturing the imagination of younger amateur bloggers. However, Tumblr does nothing that WordPress.com and BlogSpot cannot do, other than allow third-party comments using Disqus on some themes. You can also post Adsense blocks on Tumblr with the right theme, which you cannot do with the free version of WP. Other than that the same restrictions apply. The site address is still a subdomain (mysite.tumblr.com) and you have the same restrictions on themes and plugins. Ultimately, Tumblr is still only good for non-professionals who are using it as a means of personal rather business communication, although some small businesses use Tumblr as a form of social media rather than their primary online presence. Free blogging platforms are useful for anybody seeking a quick and simple blog for their own personal use. They are all 100% free. However, if you need more customization you have to pay, when they are no longer free! For example, you can use your own domain name with each of these systems, but you must pay to do so (Except BlogSpot). Professional bloggers and businesses, large and small, need more than these systems can provide, and must use a self-hosted blogging platform. You can do this using a free web hosting service, though not all free web hosting allows you to install own blogging software. WordPress Vs Blogger - Wondering Which One is Better? Free Web Hosting: Free web hosting services that also allow you to use your own domain name on the site for free. You may use either your own free or paid domain name. 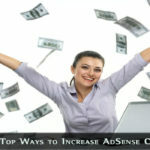 The web host receives its income from third-party adverts place on your free site. Free Web Hosting No Ads: As above but with no adverts. Always check such offers carefully, because the hosting service must get their income somehow. They usually also offer a paid hosting service but make sure there are no other catches. Free Domain Hosting: No-advert, free web hosting with a free domain: The hosting is free, and the service also offers you a free domain name. If you wish to use your own domain name you frequently must pay. Here is an example of each of the bottom two of these examples without adverts, one offering a free domain name and the other not. Each of these may also offer paid hosting plans, but it is only the free hosting we are concerned with here. Many of the free domain name services mentioned here involve geographic extensions. For example, the first here (NF) refers to Norfolk Island. However, these domains can be used anywhere in the world, and are not restricted to the country indicated. BIZ.NF: This service offers free hosting with a free domain and no adverts. When you register make sure that you choose the free web hosting account, since the firm also hosts paid personal and business plans. These offer unlimited web space (disk storage) and bandwidth (data transfer) compare to the 250 MB and 5 GB respectively of the free service. Here lies one of the catches with free hosting: you don’t get much storage or bandwidth, and this level of service is good only for small websites an blogs that do not involve a great deal of downloading and uploading, particularly of images and video files that eat up bandwidth. It’s better than another such service however, Biz.ly that offers only 50 MB space and 1 GB bandwidth. The free domain comes in form of a subdomain: yoursite.biz.nf although you can transfer your own existing domain if you wish for $17.95/year. This is also their annual price for regular TLDs such as .com and .org. You also get a script installer, one email address and 24/7 support. Others like this: byethost.com, Biz.ly. 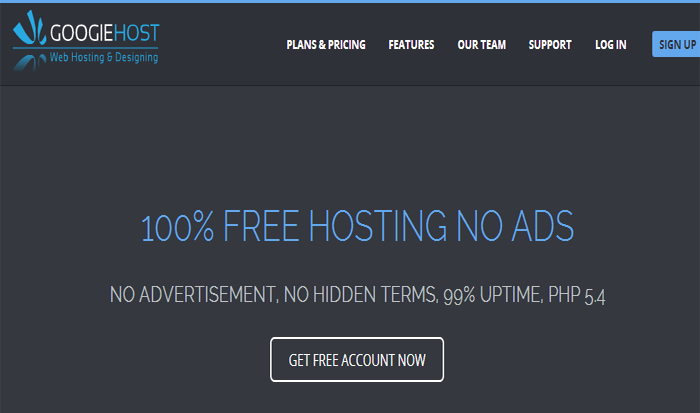 GoogieHost: This free hosting service offers a lot more, including 20 GB web space, 200 GB bandwidth, 2 MySQL databases and 2 email accounts. This is much better advert-free hosting deal than BIZ.NF, but you do not get a free domain name. Nevertheless, you can transfer your own domain name to your free GoogieHost plan using the nameservers transfer method that we shall demonstrate later. This free service is advert-free. However, you get no support and uptime guarantee is 98%. If you decide that a free web host such as Xtreemhost is suitable for you, it will not provide you with a free domain name. You must find that yourself, and having done so you will be able to transfer it free, so your total package will then still be free of any charge. There are not many sources of free genuine domains, most such services being offered when you buy a web hosting. 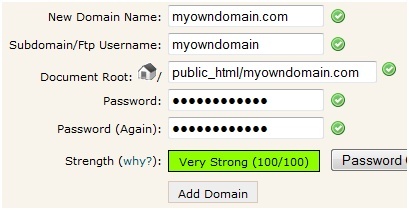 The majority of advertise ‘free domains’ are actually not domain names at all, but subdomains as shown above: mysite.freedomain.com. These do not look good for professional sites. You can now either forward the domain to your new website, or use the nameservers (DNS) system to point the domain name to your free site. More on this below. You can also pay for anything from one month to 12 months. That’s you with a new website and domain name all free of charge. As you can see, you can enter your free domain name and get started immediately. You can also choose one auto-install script with the free account, so the WordPress script makes sense. You will then be able to install WP on your site with a click. That’s you getting a self-hosted version of WordPress 100% free of any payment. 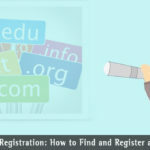 Fill in the details as above, using your new free domain name. Create your own user name and password. That’s it done – as simple as that. Replace the information with your new nameservers – there may be two or four. Click ‘Submit’ and that’s you done. What this does is to enable your new website to be seen when somebody searches using your new domain name. This can take up to 48 hours to resolve world-wide, but you can usually find your site with your browser next day. You are now in a position to switch your blog to your free website. Use the website of the CMS system you are using for instructions on installing the software. If you are using WordPress, that can be done either by using a quick installation script on your control panel, or you can go to the wordpress.org website and follow the instructions. This is one of the main competitors to WordPress and offers some very good-looking templates. There are others, although WordPress is by far the most popular. As mentioned earlier, free hosting comes at the cost of reduced web space (hard disk storage) and bandwidth (file transfer capacity.) Some even have maximum and minimum traffic allowances: you must either exceed a certain minimum or not exceed a stated maximum. If you do you either pay a fee or you could even have your account terminated. Another issue is with your visitors and potential customers. They may see your site as being a free site, including your TLD or file extension. Many will only deal with websites with the top TLDs such as .com, .org, .co.uk, .us and so on. While they may not openly say so, they may have concerns about doing business with somebody running a free site with an unusual file extension. 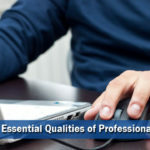 Such issues do not arise with amateur or personal blogs, but if you are running a business and starting to attract a fair bit of traffic, then maybe you should be thinking of upgrading to a paid service and present a professional front. You feel that you have learned enough to become more professional. Your traffic is on an upward curve, and doesn’t look like stopping. You need more security than your free service can offer. You need to upgrade your metrics and traffic analysis. You need more scripts and software than your free website or blog can provide. You feel the need for more autonomy and more choice of templates. You find your bounce rate rising. Otherwise, if you want to create a free website or free blog, then that is how to do it. There is nothing wrong in doing so, and it is the ideal way to learn if you intend to become a serious or even professional blogger or internet marketer. It’s really an awesome post. The platforms you have shared are really good but personally, I would say that there is no better platform than WordPress. I know this is off topic but I’m looking into starting my own blog and was curious what all is needed to get setup? I’m assuming having a blog like yours would cost a pretty penny? I’m not very web savvy so I’m not 100% sure. Any suggestions or advice would be greatly appreciated. For a blog like this, you need a domain name and web hosting. Then install WordPress and choose a good theme. That’s it! Free website or blog is not good for the commercial purpose, my first blog was banned because I added little extra HTML code. Blogging is a serious business, never start a free blog and for the personal blog, you can use free blog platforms. Indeed you explain nice information on create website. You shared here details like domain name, name server and much more. Although thank you very much for sharing nice information. Thank you so much for your great efforts to show us the superb explanation, I have tried this and it worked. All are just simply superb. Nice article with useful information. Million thanks! Really great post shared. Now I got a clear idea of creating website or blogs with free domain name. I enjoyed your this blog post! Thank you so much for sharing this valuable information. Great Stuff! Thanks! You gave us lots of information about the new platform, thanx a lot for sharing along with samples that are very helpful for we beginners. Thank you. This is indeed an in-depth article on this subject and you have done a great job to produce it. I enjoyed reading it. Thanks for sharing this article and have a great day.